Tac Force NightClaw Assisted Opening Folding Karambit - Matte Black | BUDK.com - Knives & Swords At The Lowest Prices! There's no question - traditional fixed blade karambits are menacing, potent and super cool, but they're not exactly well suited to everyday carry. Until now, that is. 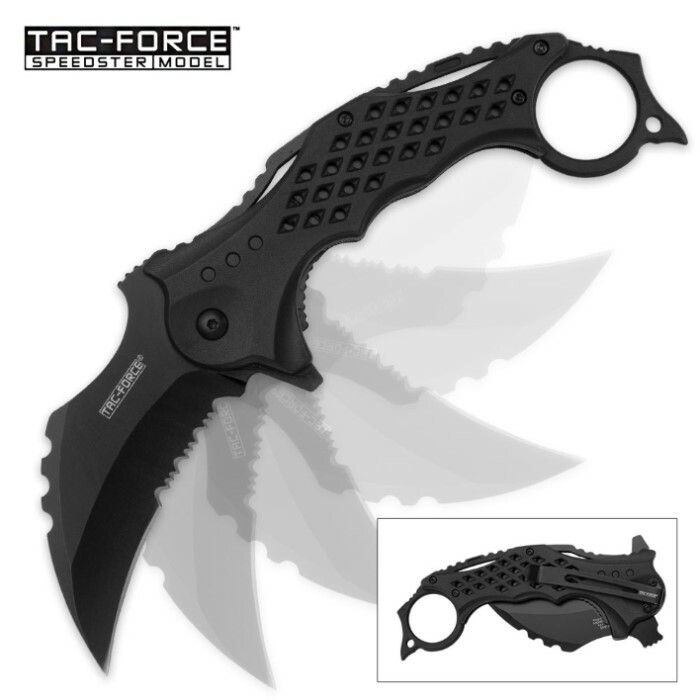 The Tac Force NightClaw offers the sweet sinister profile, distinctive finger ring and ominous allure of the traditional southeast Asian karambit, in a convenient, folding, pocket-friendly package. In classic karambit form, its 3" 3Cr13 stainless steel blade is gracefully arced and talon-like. No mere imitator, however, the NightClaw blade packs some useful extras you won't find on a typical karambit blade. It's shrouded in a sleek, nonreflective black coating and partially serrated - perfect for cleaving fibrous, woody and/or other challenging materials. Thanks to Tac Force's exclusive "Speedster" assisted opening mechanism, the blade deploys in all its raging glory in just a blink of an eye. A gentle tug of the flipper is all it takes to send it flying open in a near-instant streak of black, and, once open, the NightClaw's sturdy liner lock keeps the blade planted firmly in place for added safety and stability during use. Again, in classic karambit fashion, the blade arc continues through to the handle and terminates at the stainless steel finger ring, yielding the instantly recognizable karambit crescent moon shape. The durable black ABS handle scales are ergonomically contoured and aesthetically enhanced with a cool pitted motif. Comfortably sized at 5 1/2" closed, the NightClaw fits easily in average jean pockets, especially with the built-in pocket clip. 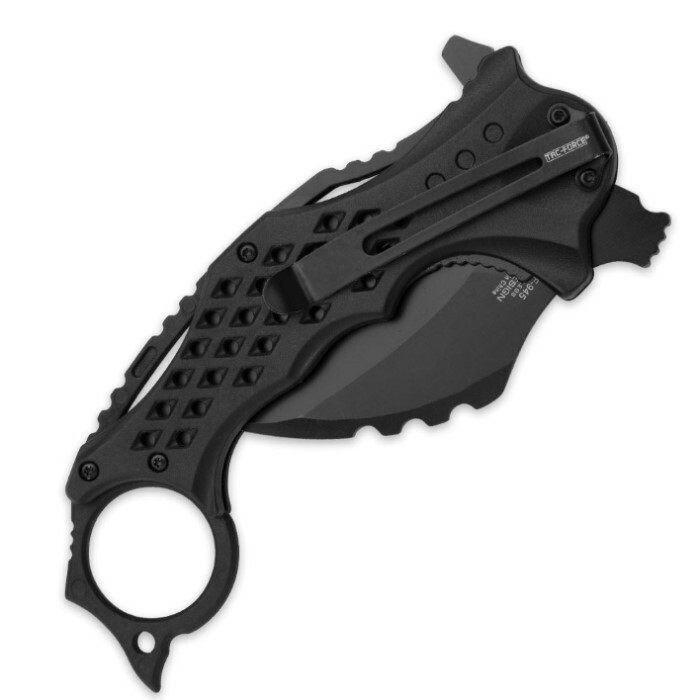 Perhaps you never dreamed of seeing "everyday carry" and "karambit" in the same sentence, yet here it is bold and true: the Tac Force NightClaw Assisted Opening Folding Karambit maintains all the unbridled might of the traditional karambit, but comes in a smart folding package engineered to be an ideal everyday carry pocket knife. Need we say more? I purchased this knife along with 10 other knives. I'm a particular fan of Karambit knives, particularly folding/concealed types. This is my personal assessment on this unit: I LIKED: - Larger profile than most folding Karambits. - Light profile due to polymer handle. If you carry it in your belt, you may forget it's there. - Sharp and serrated edges gives it a little more "umph". I DID NOT LIKE: - The construction and materials are not the best. The opening mechanism failed after a couple of finger pushes. - Trying the close the knife causes the plastic handle to warp and detach from the metal frame. For the price, this would be an ok knife as a everyday beater. If it breaks, disposing of it would not be painful. As a self-defense knife, deployment is unreliable, but once locked in place, would work just fine.